How the AIDAbella will look at sea when launched in April 2008. The AIDAbella's keel-laying ceremony at Papenberg. The AIDAbella is part of a four ship order, the first of which was the AIDAdiva launched in April 2007. The distinctive bow design of AIDA ships. 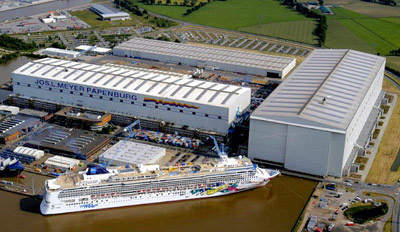 The Papenberg shipyard in Germany, where the AIDAbella is being constructed. The German cruise line AIDA Cruises (formerly Seetours), a part of Carnival Corporation (AIDA Cruises is the German branch of Costa Crociere SpA), has placed contracts with Meyer Werft in Papenburg for the construction of three 68,500GT cruise ships. Delivery of the three new club ships is scheduled for April 2008, April 2009 and April 2010. The cruise ships will each have a length of 252m and a width of 32.2m. These club ships will present the third generation of ships built and operated according to the AIDA concept (a series of four ships, which also includes AIDAdiva). All four new builds will cost a total of €1.3bn. 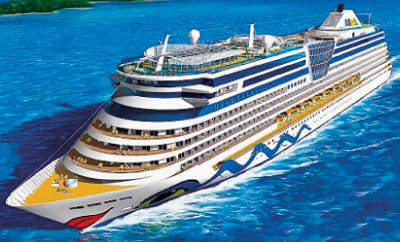 The ships will accommodate 2,050 passengers in 1,025 cabins. The ships will feature the latest technical innovations and interior design novelties. 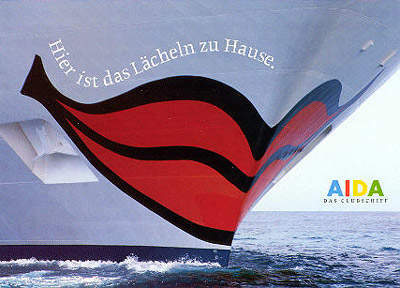 The well-known brand design regarding the outer appearance of the AIDA ships will be maintained. The latest custom designed club ship, the AIDAdiva (delivered in 2007), will have a sister ship the AIDAbella by 2008 (ship cost €315m / $409m). AIDA ships operate from German ports to Scandinavia and the Baltic, as well as on fly-cruises in the Mediterranean and Canary Islands. Winter brings fly-cruise schedules for all the ships in the Mediterranean, Canary Islands, Caribbean and Middle East. Four large diesel engines will generate 36,000kW (50,000hp) and the new ships will be able to operate at a speed of more than 21kt. 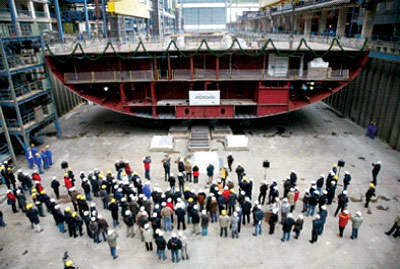 In March 2007, at the Papenburg yard of Meyer Werft, the keel of AIDAbella was laid. The traditional lucky penny was placed under the first of a total of 55 blocks, which weigh approximately 450t. The block was 32.2m wide, 6.90m high and 16m long and the ship is being built under the yard number S.666. In 1996 AIDA Cruises introduced a totally new concept called ‘club cruising’. This was based on Germany’s popular Robinson Club resorts. AIDA’s ‘club ship’ experience was different from traditional cruising; except for a small a la carte alternative restaurant, all the dining was buffet-style, there were no dress codes, and a strong emphasis was put on wellness and fitness-related activities. 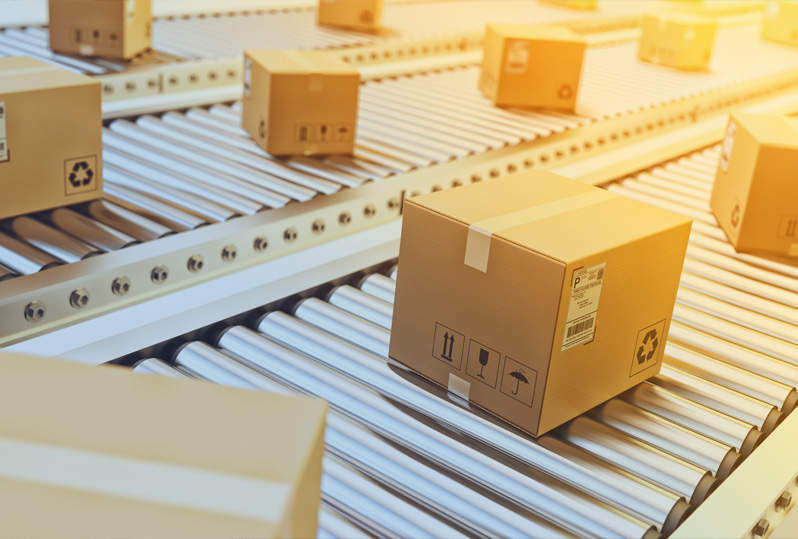 This sparked a whole new area of the market and has even been taken up by Stelios Haji-Ioannou in his new Easy Cruise product. The ‘club ship’ concept features two large buffet restaurants, along with only a small (extra-cost) waiter-service restaurant. There is the usual array of bars and lounges, a large theatre, a big pool deck with a volleyball / basketball court, an absolutely vast AIDA Spa, an equally big fitness complex called Fit & Fun that even includes an indoor putting green and golf simulator, and a kids club. The informal ‘club’ ethos is reflected in every facet of the experience, unlike almost all other cruise ships, off-duty crew are allowed to mingle freely with passengers. This ship will, like its sister ship AIDAdiva, have a large number of cabins with balconies, and will offer more space, more dining choices (with multiple specialty restaurants), more amenities and more luxury. The highlight of the ship will be the Theatrium, a circular, glass-walled, glass-domed combination theatre / nightclub located right in the middle of the ship and surrounded by various bars and other entertainment venues. 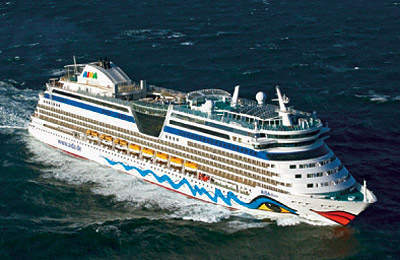 The master of the AIDAbella will be Captain Josef Husmann who has worked with AIDA Cruises since 2003.